Pain Management for Veterinary Technicians and Nurses guides readers through the important concepts of animal pain management, providing specific approaches to managing pain in a wide variety of veterinary conditions. 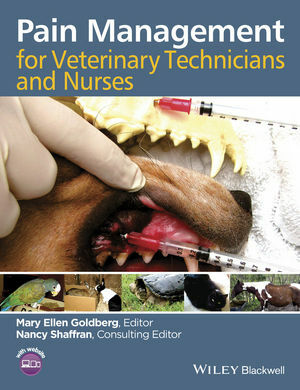 Emphasizing the technician's role in advocating for the patient, the book equips technicians with the knowledge needed to manage pain in dogs, cats, horses, livestock, exotics, and zoo animals. Logically and comprehensively covering this difficult subject, Pain Management for Veterinary Technicians and Nurses provides both introductory material on the tenets of pain management and specific techniques to apply in the clinical setting. With information on recognizing and understanding pain, the physiology of pain, pharmacology, and analgesia in different settings, the book outlines how to practice good pain management as an integral part of nursing care. Pain Management for Veterinary Technicians and Nurses provides both basic and advanced information, allowing students, practicing veterinary technicians and nurses, and veterinary staff alike to take a more active role in pain management and develop a more thorough understanding of this complex subject. Mary Ellen Goldberg, BS, LVT, CVT, SRA, CCRA, is an instructor of Anesthesia and Pain Management at VetMedTeam, LLC. She is on the Board of Directors and Executive Secretary of the International Veterinary Academy of Pain Management and a charter technician member of the American Association of Rehabilitation Veterinarians. Nancy Shaffran, CVT, VTS (ECC), is an international professional veterinary educator with an extensive background in critical care and pain management. She is a charter member and past president of the Academy of Veterinary Emergency and Critical Care Technicians and is president elect of the International Academy of Veterinary Pain Management. intended audience and further afield. Pain Management for Veterinary Technicians and Nurses companion website features review questions, charts and protocols, videos, and the figures from the book in PowerPoint.